It’s a tradition and, unfortunately, most wines aren’t available. Unless the wine critic is familiar to you, use their ratings as a guideline. Know and trust your own palate. Top wines from small production wineries rarely make it to the grocery store shelves. They just don’t make enough product to keep a shelf presence year round. So, traveling to Woodinville, Eastern Washington, Willamette Valley or California may be an option. For unavailable wines, put them on your watch list and see what the next vintage brings. Lists of high scoring wines can be instructional about good vintages, cool climates and emerging regions. One last thought when perusing annual wine lists. 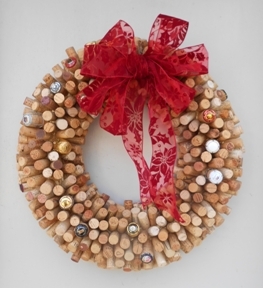 If a critic tastes 10,000 wines a year, that’s an average of 27 bottles per day. That critic needs help, so it may be a “collective palate” judging that $45 bottle of wine. And that collective palate, made up of several tasters, could change over the year. It’s a list heavy with sunny Spain’s top grape varieties, Garnacha and Tempranillo. Spanish wines are perfect for great wines at a small price. Even Gran Riserva Riojas are only about $40. Borsao Tres Picos Garnacha 2014 is made from old vines; it’s my unfailing favorite. This purple red Grenache from the Campo de Borja region has a gorgeous aroma and flavors of raspberries and spice. It’s imported by consultant Jorge Ordonez who seeks out old vines and well made Spanish wines. Solnia Tempranillo 2015 is crafted in the land of Don Quixote, La Mancha. The old vine Tempranillo grapes are hand harvested. From the deep color of the wine, you can tell it went through a long ferment and maceration. Aged for six months to give it further complexity, the wine is balanced and very drinkable at $10. Also imported by Jorge Ordonez. From the Toro region, Enebral Tinta de Toro 2009 is made by the Well Oiled Wine Company. Tinta de Toro is a clone of Tempranillo. Enebral’s vineyards are old and yield very low production. Also harvested by hand, the wine sees French oak for 11 months, then matured in bottle for six months before release. You can tell Toro is a warm region with an alcohol content of 14.5% and you’ll be amazed at the color and balance of this wine – for only $12. 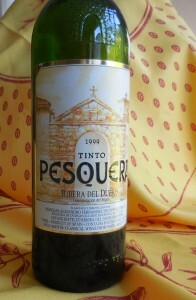 Tinto Pesquera Crianza Ribera del Duero 1999 is another all-time favorite and one I had been hoarding for some time. Crianza is a term used to describe the style of Spanish wine. It’s an aging regimen and describes the youngest category of a wine that has been matured in wood. A crianza may not be sold until its third year from harvest and spends a minimum of six months in barrique. Gotin del Risc Mencia 2012 hails from the Bierzio region. Mencia is a red grape variety widely grown in Northwest Spain. It’s a very fragrant grape with glass staining capabilities. It’s rich but not overpowering. Think paella partner for $15. Atlas Peak Renegade 2013 is amazing. Atlas Peak is also an American Viticultural Area located within the Napa Valley AVA. It’s one of the higher elevations in Napa. The westward orientation also extends the amount of direct sunlight to ripen grape sugars. The soil is volcanic and very porous which means cool evenings for perfect pH. The 2013 Renegade is composed of 93% Syrah, 4% Malbec and 3% Petit Verdot. This wine is loaded with aromas of dark berries, violets, and tobacco leaf. Aged for 22 months in French and American oak barrels, the flavors are lush with dark fruits, leather and spice. The Stoller Reserve Pinot Noir 2013 is one of the best Oregon Pinots and reasonably priced. From the best vineyard blocks and French barrels (30% new) in the cellar, it’s aged ten months and then blended prior to bottling. What comes out of the bottle is an marvelous balance of cherries and baking spices with a long, long finish. Bill Stoller worked on the family farm as a child but as an adult he knew that the rocky terrain that broke discs and plows when tilled, the southern-sloped hills that made growing wheat difficult and the low-yielding Jory soils were all the ingredients of a successful vineyard. Today, the family vineyards are planted with Pinot Noir, Pinot Gris, Riesling, Tempranillo, Syrah, and Pinot Blanc. Intrinsic Columbia Valley Cabernet Sauvignon 2014 made two publications’ Top 100 lists. This is the first release from this winery. Part of the wine was aged for a remarkable nine months on the skins, another part in stainless steel and the rest in neutral oak. The label claims, “It dazzles with brooding aromas of herbs and black cherry. The flavors are ripe and balanced with smooth tannins and a long finish.” Dazzles and brooding aside, I’m inclined to agree, found it reasonably priced and still available. Another gem from the cellar was the Long Shadows Pedestal Columbia Valley Merlot 2004. Long Shadows collaborates with highly regarded winemakers around the world. They use Washington grapes to make wine like they do back home. It’s fascinating to taste a Washington wine next to another country’s wine. For this wine it’s Michel Rolland, owner of Le Bon Pasteur in Pomerol and consultant to many others. Let me just name drop here – L’Angelus, Clinet, Smith Haut Lafitte, Pavie and Troplong Mondot in Bordeaux; Simi, Newton, Merryvale and Harlan in California. He has even consulted at Ornellaia in Tuscany and Casa Lapostolle in Chile. Pedestal has pedigree. Bollinger RD (recently disgorged) 1985 was a pretty amazing bottle. Golden, aromatic and full-bodied, it didn’t have a lot of bubbles but I fully expected it to not be sparkling. I love Madame Bollinger, who would make her daily vineyard inspections in the 1950s by bicycle wearing a dress, a flower in her hair and her pearls. Cheers and All the Best in this New Year!